Feature: Upload d7 reports & attach to PC Repair Tracker work orders. Requirements: d7 v9.6 or higher, PCRT v1.37 Final or higher. In the PCRT installation on your server, upload the d7 directory from the PCRT update package, preferably in a location that is not web accessible for security reasons. The d7 Folder in the PCRT package contains a .htaccess file that should block any web access to the folder, but it is better to not place it in a web accessible folder anyway. 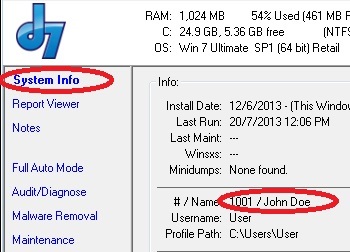 The above report directory variable (in bold) must be changed to point to the uploaded d7 directory from step one. This can be an absolute path on your server, or a relative path (meaning relative to the /repair directory.) Make sure to set the permissions to 777 on this folder in order to allow PCRT to be able to delete and move the reports. 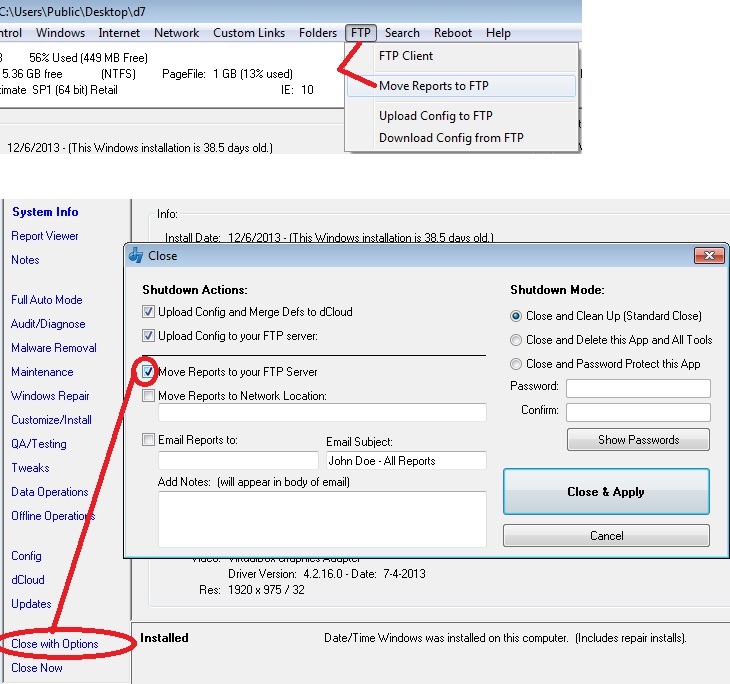 Enter your PCRT server address in the FTP server field. Enter your FTP login credentials to the PCRT server in the appropriate fields. That’s it, save config and restart d7. Also on the dCloud / FTP Server config page, you will see a field for Config Directory. Yes, you can store your d7 configs with the FTP directory structure on your PCRT server. There is NO special feature or integration between PCRT and your d7 configuration storage, it’s just there. This field can be populated with anything you want, but should not be the same as your Reports Directory field. Whatever directory you specify here will be automatically created by d7 if it does not exist. 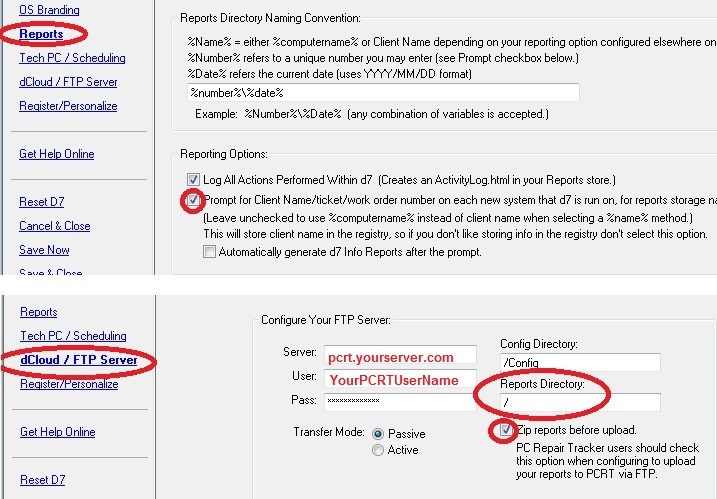 Once everything is configured properly, if you upload a report from d7 you will get an alert in PCRT stating that “d7 Reports are ready.” Clicking on that alert allows you to attach the uploaded reports to your work orders.